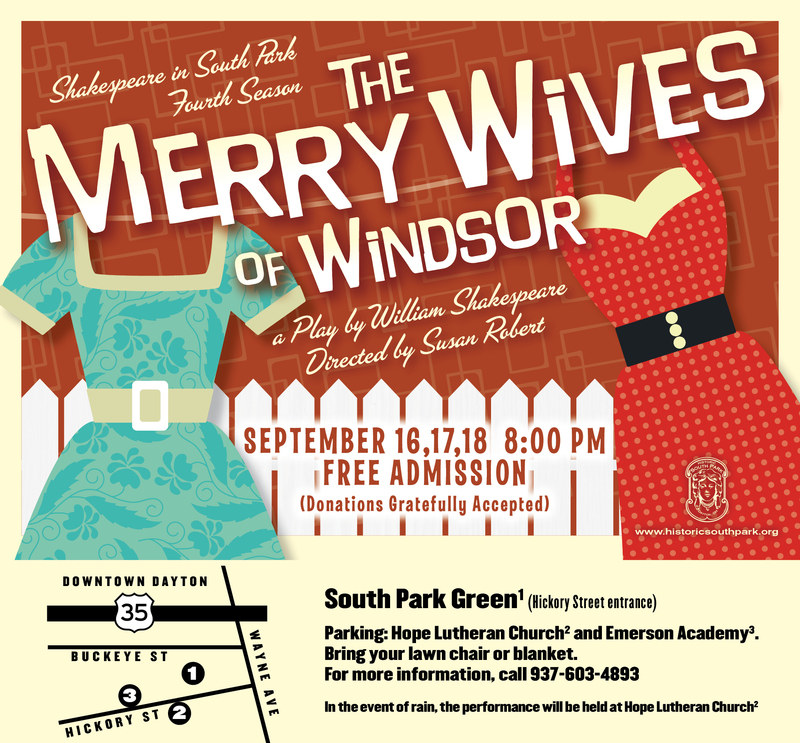 The Shakespeare in South Park Company is returning for a fourth year to present the whimsical comedy, The Merry Wives of Windsor. The show runs from September 16-18 starting at 8:00pm. Though perhaps less known than many of Shakespeare’s great works, The Merry Wives of Windsor is unique in several ways that has endeared it to audiences for over 400 years. The play was written for and about the common people of the day. It is the only play Shakespeare ever wrote that does not include a lord or lady, a king or queen, a princess or high class individual and only middle and lower class characters. It is also the only play he ever wrote almost entirely in prose (or common language) which means it is spoken plainly and not rhythmically like poetry, again lending itself as a play for the masses. The story revolves around an older fat knight named Sir John Falstaff who comes to town hard pressed for money. He devises a plan to woo two wives (Mrs. Page, and Mrs. Ford) and then leech off of their husband’s money by writing them each a love letter, and confessing his desires for them. Mrs. Page and Ford, both good friends and not fools, realize the Knight had written them identical letters, and spend the rest of the play pranking and playing tricks on him to teach him a lesson. The play also involves the marriage of Mrs. Page’s daughter Anne. Anne’s parents each support a different suitor for her to marry; the eccentric French Physician Dr. Cauis, and a local middle class idiot, Abraham Slender. Neither has her heart, and she searches for a way to marry one that she truly loves. First year director Susan Robert has decided to set the play in the 1950s in the style of a sitcom. The whimsical “middle class” comedy fits amazingly well with the situational humor made popular by classic shows such as I Love Lucy. Taking place around a typical American 50s suburb, complete with picket fences and barbeques, the setting will aim to draw people in who are familiar with sitcoms from the era, and ease them into the plot. Robert explained the crafty and clever wives of Windsor reminded her of Lucy and Ethel when they would play tricks on their husbands to get back at them. Each scene also presents new and awkward situations for characters to react to, including Falstaff having to dress up as an old woman, a messenger boy found in someone’s closet, a complete mishap that leads to a duel, and plenty more! With misunderstandings and double entendres abound, quick witty character interactions, and many slap-stick moments, the laughs are non-stop. Shakespeare in South Park productions are free to the public, while contributions are gratefully received and used to defray costs of the show. Bring a lawn chair or a blanket to the South Park Green located on Hickory Street at James. In case of rain, the play will be staged at Hope Lutheran Church, 500 Hickory Street.